So we'll see how submissions go today, but my plan (which will stay fluid) is this: Each day, I'll post links to pieces submitted by other writers on some of the films I plan on covering that day. Occasionally I'll highlight a submission by a notable film writer with its own post. 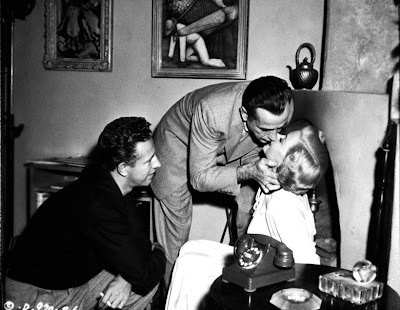 Lastly, at the end of each day, I'll to try to post links to other pieces that have cropped up recently around the net in honor of Nicholas Ray's Centennial. "Ray is an interesting director. Martin Scorsese came up with several different terms for filmmakers in Hollywood: the illusionists, the smugglers, and the iconoclasts. In this system, Scorsese classifies Ray as an iconoclast - someone openly challenging the status quo in terms of subject matter and style. But to me he's a bit more ambiguous, dwelling in a kind of no man's land between the smuggler (who subverts Hollywood from within) and the iconoclast. His famous films from the 1950s clearly exist within the framework of Hollywood conventions - a filmgoer at the time could attend a Ray movie without being startled and taken to an entirely personal universe, the way a Welles or Kubrick film was bound to do. Yet no doubt, there must have been a lingering sense of unease, moreso than with the strong but concealed personalities of a Ford or Hitchcock ("concealed" in terms of genre and entertainment devices providing cover for personal expression). Ray's films are works of slow emotional exposure, potent enough to reach and affect the viewer but restrained enough to to break the fabric of the film, maybe to saturate it. That's a rather abstract definition of concrete effects, but hopefully I can rectify that with my upcoming piece." Suffice to say that reading the opening salvos of They Live By Night (and thus revisiting the film) has made me wonder if I understated the startling effect of his cinema, so it's going to be an interesting blogathon. Thanks, Joel. I'm already behind on my reading, but I'll get to everyone's, I promise.